At the time of his adoption, Miller was a seven-year-old black Labrador mix who no one seemed to want. He spent most of his life in shelters and seemed destined to be homeless for the rest of his life – until William changed his world. William is an Army veteran. Together with his wife, Pamela, they were searching for a new pet friend. They live in a fairly rural area in Ohio, and William needed a pet to help with anxiety and depression. In many ways, he and Miller were on similar paths. Two older gents, both in need of a hero. Fortunately, GreaterGood.org partner, Pets for Patriots, serves communities of all types, populations and sizes. They’re proud to have programs in many rural areas of the country, including their partnership with Geauga Humane Society Rescue Village. William met Miller there, and the kinship was instant. When you shop at iHeartDogs.com, part of your purchases support various charities. This makes happy endings like this one possible! Adjustable Camo Paracord Dog Collar, $17.99-23.99. 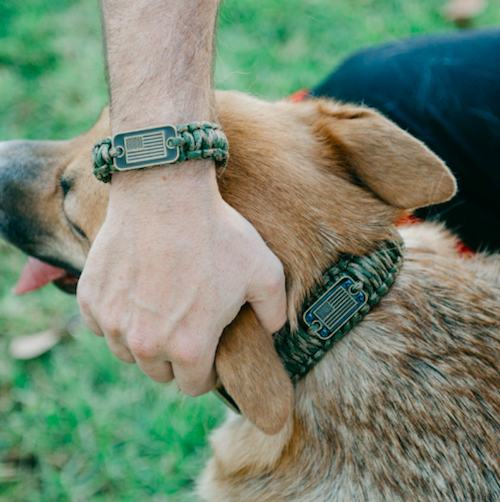 20% of sales are donated to help pair veterans with shelter or service dogs.